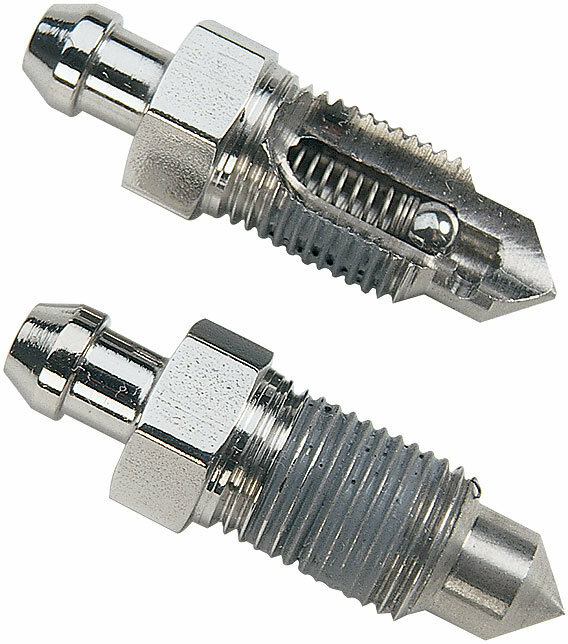 The patented bleeder screw with the built-in check valve. Once installed, it becomes a permanent part of the brake system. When it is time to bleed your brakes, you loosen the Speed Bleeder 1/4 - 1/2 turn and pump your brake pedal. When the pedal is depressed the pressure generated opens the check valve letting air and brake fluid out of the end of the Speed Bleeder. When you release the pedal to the up position, the check valve closes and prevents any air from re-entering. When bubble free fluid is evident you close the Speed Bleeder. That is all there is to bleeding your brakes. Sold in Pairs. Fits front and rear brake calipers.